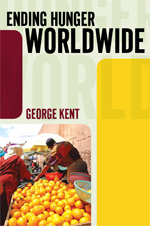 Saybrook Professor George Kent – who teaches STR 6585 “The Human Right to Adequate Food” – has published Ending Hunger Worldwide, a book that challenges the naïve notion that everyone wants hunger to end. Rather, hunger ensures that some people will work for very low pay, so employers make good profits and consumers enjoy cheap goods. Hunger analysts typically focus on agriculture yields and interventions with capsules and supplements. They rarely acknowledge that hunger is a deeply social issue that is shaped by the ways in which people treat each other. The central concept that drives the book is that in strong communities, people don’t go hungry. Strong communities have high levels of concern about one another’s well-being. People may provide food to one another when that is necessary, but more fundamentally, they ensure that all have decent opportunities to provide for themselves.There is no shortage of food in the world; there is a shortage of opportunities. Kent’s other recent publication, Regulating Infant Formula, assesses the widespread assumption that the government or some international agency is monitoring the quality of infant formula. Government agencies sometimes raise alarms when a batch of formula is seriously contaminated, but they are not monitoring the product to ensure the health of children. More than half the infant formula used in the U.S. is provided by the government, at no cost to the families. The government monitors the economic impact on the manufacturers, but not the impact on the health of children. It has been estimated that more than 900 children in the U.S. die each year because they have been fed with infant formula. Professor Kent was invited last year by the Food and Agriculture Organization of the United Nations to speak on Ending on Hunger Worldwide for its Global Forum on Food Security and Nutrition. The report from this event is available as a pdf for download.